After suffering a 29-point thumping Saturday afternoon against her alma mater, Pitt women’s basketball head coach Suzie McConnell-Serio had one question. “Who thought igniting this rivalry was a good idea?” McConnell-Serio said after the Panthers’ blowout defeat against the Penn State Nittany Lions. The Nittany Lions (8-2) used a dominant second quarter to break open a tie game and cruise to a 91-62 win over Pitt (7-3) in University Park, Pennsylvania. Penn State guard Lindsey Spann led all scorers with 20 points on the afternoon. Spann got the scoring started with a layup just over two minutes into the game, then a 3-point play by Nittany Lions center Ashanti Thomas made it 5-0 Penn State. The Panthers then responded with a 3-pointer from sophomore forward Kauai Bradley and a layup from sophomore forward Brenna Wise to tie the game, 5-5. A layup followed by a 3-pointer from Pitt center Brandi-Harvey Carr completed a 10-0 run to give the Panthers a 10-5 lead, but the Nittany Lions quickly tied it back up at 10. The teams went back and forth throughout the first quarter, which ended with the game tied at 19. 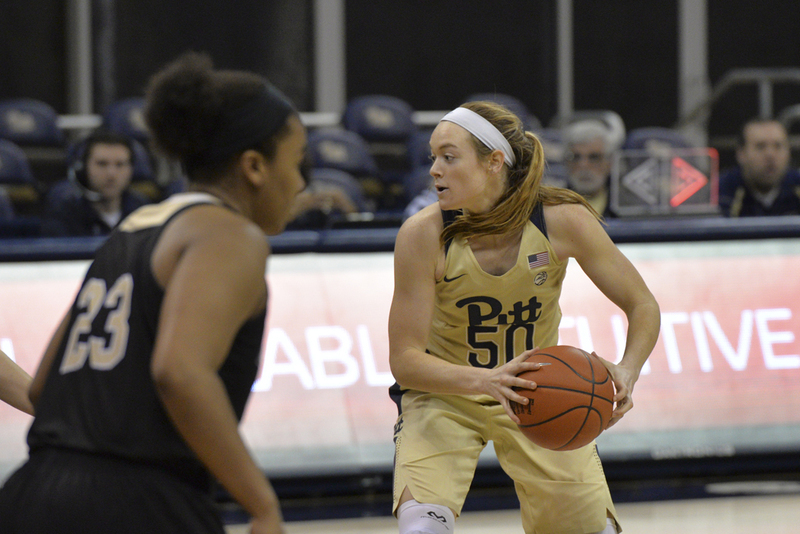 Pitt took a brief 22-19 lead on a 3-pointer by first-year guard Alayna Gribble, but Penn State immediately answered with a 17-0 run. The Nittany Lions outscored the Panthers 25-5 the rest of the half to build a 17-point halftime lead. Pitt cut the deficit to 14 early in the second half, but that was as close as the Panthers would come the rest of the way. Penn State used an 8-0 run to take a 57-35 lead and widened the gap to as much as 26 before ending the quarter up 68-50. The Nittany Lions then outscored Pitt 23-12 in the final quarter to roll to a 91-62 victory. Wise led the Panthers with 15 points and seven rebounds while first-year point guard Jasmine Whitney contributed 14 points and five assists. McConnell-Serio stressed that her team needs to do a better job of playing as a unit and believing in the system in order to beat teams like Penn State. Pitt will get the next eight days off before traveling to Niceville, Florida, to participate in the Patrick Harrington Tournament. The Panthers will take on the University of Texas at El Paso Monday, Dec. 19, at 5 p.m.